You might have wondered what would possess your dog to eat something like grass. The reasons are not as simple as you might expect. Here are some of the most common yet surprising reasons you favorite pooch may be indulging in the green stuff. The nutritional needs of a dog can vary a lot based on their activity level, breed, age, and other environmental factors. Just because that bag of fancy dog food you bought says it meets national dog food standards does not mean it is right for your dog. A lack of fiber in the diet is sometimes the cause, but it can also be due to a lack of vitamins and minerals. A veterinarian can run a series of tests like that described by Dr. Patty Kuhly of Vetstreet. It is important to remember that dogs are not just carnivores. Canines have always eaten some level of vegetable matter. In modern society, grass is the most common green matter available, so they eat it. Dogs will pick out fruit and berries in nature. If you go berry picking, don't be surprised when your dog eats berries that are within reach. There are increasing numbers of pet owners who are choosing to cook and blend their own pet foods. While it is a noble cause to want to provide a good diet for you dog, it is important to make sure that what you are feeding them is actually nutritionally complete. People and dogs can do some pretty silly things when they are bored. Providing fun activities and spending time with your canine companion can curb some of their appetite for grass. 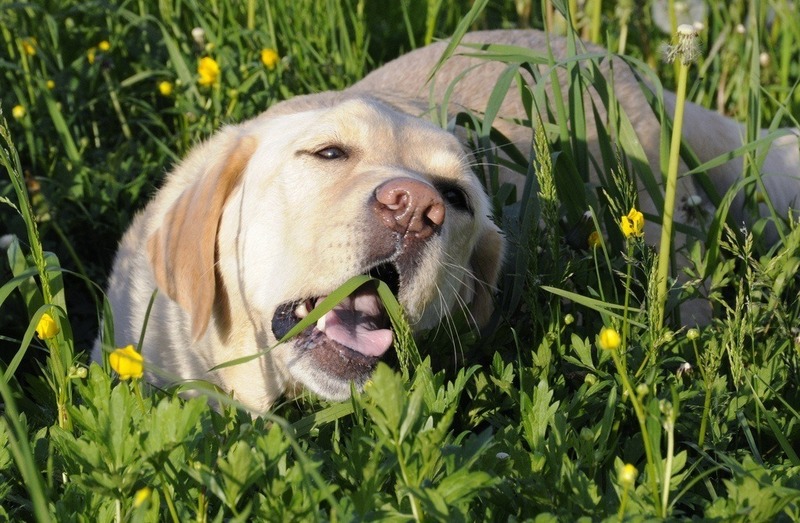 Puppies and energetic breeds of dogs are particularly prone to grass eating behavior. Over time, you may notice that your dog stops grazing as much as they did after they get a bit older. If you have to leave your dog by themselves very often, they may be experiencing separation anxiety or loneliness. This type of doggy depression is one reason so many people have two dogs. Some breeds of dogs are more prone to separation anxiety than others. If you have a breed that is prone to nervousness, then you need to offer even more activities and comfort than with a more indifferent breed. There is some speculation that dogs turn to grazing when they are suffering from parasites or nausea from some other problem. If you suspect this it is best to visit your vet for a complete parasite screening. There is ample evidence that dogs eat grass to help purge their stomachs if they are feeling nauseous. After vomiting, many dogs feel better and recover rapidly. This means that if your dog is eating grass often and vomiting, there may be a secondary condition they are suffering from. It may be that your buddy just got into the habit of eating grass. Dogs can easily become obsessive compulsive. Giving the suffering dog something to keep them occupied can help decrease the level of fixation they have. If you have an inside dog, then it is possible to limit where they spend outside time. If your dog seems overly nervous, there may be another issue bothering them. When in doubt it is always worth it to get the opinion of your veterinarian. Keep in mind that grass eating is not considered harmful, but there is the risk of pesticide or herbicide poisoning if your dog eats grass that has been treated recently. If your dog is a grazer, you may want to avoid some green spaces. With so many varying opinions as to why dogs eat grass, it is safe to say that it depends on the dog and their health. If your veterinarian doesn't find anything wrong then you dog might just like to chew on some tender shoots once in a while.